Dry Erase Marker Board with 20 Year Guarantee! 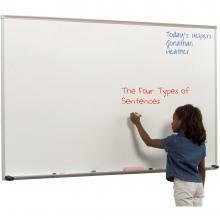 This dry erase marker board has a high pressure laminate dry erase surface. The marker board is trimmed in anodized aluminum and features a full length accessory tray with rubber safety end caps. Also included is a full length tackable map rail. - Made in USA. TAA compliant.